410 Jamie has cautioned all of us from massive experience about the popular vendor of front end components "Detroit Axle". Several other members have been negative about them due to a couple personal experiences and a lot of lore. I have been on the positive side and have had several good experiences with their products and no bad... until yesterday. 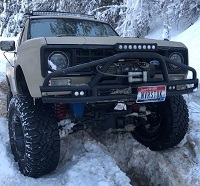 I don't remember exactly when I did my front end, but it has not been 2 years and I have not been 4 wheeling. Everything still works but the boots are falling off my lower balls already, exposing them. I will have to replace them next summer because I don't know how long the boots have been open. Any open boot drastically shortens the life of a ball joint or any other front end part. So if you buy a junker to sell and don't want to spend a fortune I would still go with Detroit axle. If you want to keep it even a couple years please buy a better product. parts are cheap labor is expensive, so don't skimp on the parts!! 1) The prices appear to be on the lower side. 2) No manufacturer is posted or Country of Origin ! Some of the parts did have a 10 year warranty, wondering how long it would take to get a replacement part. Thx for the info ! Page processed in 0.1506 seconds (16% database + 84% PHP). 44 queries executed.